The Spring festival of Hidrellez, celebrated in Istanbul and throughout the region during the first week of May, may be attributed to the ancient prophets Ilyas and Hizir, but its rituals, venerating fire and water, reach back to the roots of Anatolian civilization. 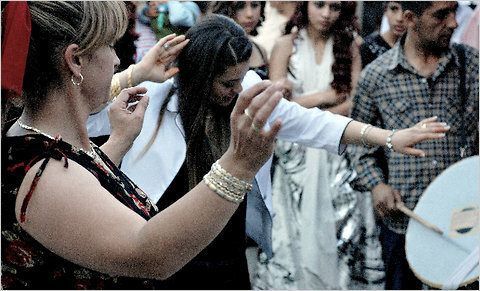 In Istanbul today, particularly in Romani districts, Hidrellez comes in the form of a memorable street party. On May 6, for the second consecutive year, an alternate Hidrellez festival will be held on the Bosphorus-side, Romani neighborhood of Cayırbasi by organizers 9/8 Roman Platform and the Sariyer Municipality. Free of charge and open to the public, this is an ambitious event in a hardscrabble community. Local residents, with their humble streets as a stage, are both the hosts and the guests of this living tradition. Starting at 1 pm, there will be a photo exhibition examining the Cayırbasi community, along with other cultural activities throughout the afternoon. Well-known Romani musicians will take the stage around 7:30 pm. Concerts officially end at midnight but the party will likely continue well into the morning behind the stage in the alleyways of the neighborhood.